As the “best soccer team of the 20th century,” Real Madrid won two UEFA Champion League Cups between 1998 and 2001 while paradoxically spiraling into debt. Real Madrid’s situation was not unique; other european football clubs were similarly facing financial hardship. At the time, income generation for a football club was suffering from limited stadium capacity and decline in demand for media rights. When Florentino Pérez accepted the Real Madrid club presidency in 2000, he aspired to reduce the $288.5 million dollars of debt by reorganizing the club structure and diversifying income in both the traditional and brand-based business models. Pérez restructured the sporting, social, marketing and cooperate aspects of the club. In the sporting sector, players with a significant media impact were recruited to promote the Real Madrid brand. However, in order to maintain the team’s core values and identity, the club also heavily relied on their young-players team for recruitment. Social promotion focused on creating a friendly public image by becoming ambassadors of UNISEF, reducing violent events in the stadium and maintaining transparency. 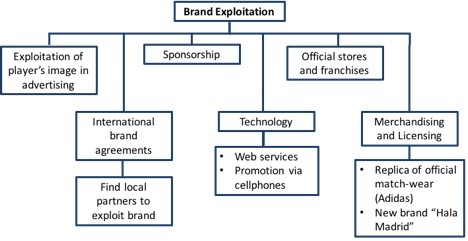 Marketing reorganization transformed fans into customers by promoting the “Real Madrid” brand through strategic sponsorships, exploitation of player’s image rights, sales of Real Madrid merchandise, development of a TV channel and solidification of fan loyalty, including international fans. Real Madrid’s international marketing team expanded brand recognition to emerging markets in the Asian, Arab and Indian regions. International brand promotion through Real Madrid TV channel availability, merchandise and local partnerships generated $7.2 million in Mexico in 2002, $26-$48 million in the Asian markets in 2003 and $24 million in Japan. Finally, cooperate restructuring involved recovery of assets that had been previously sold to other firms, such as advertising and media rights, and development of new sources of revenue. Diversifying income was accomplished by improving the traditional business model, which consists of revenue from soccer matches and team facilities, and developing brand exploitation. Figure 1 details Real Madrid’s improved traditional business model. Since non-season ticket holders spend more money at the stadium, season tickets were limited to 60,000 seats. In-stadium services were enhanced by adding bars and restaurants, offering cushion rentals, and enhancing the VIP packages. Improved VIP services such as catering, limousine services and luxury accommodations increased revenue by 40%. In addition, by building two in-stadium restaurants, hosting business events in the VIP boxes and offering tours, the stadium became a source of year-round profit. Figure 1. Improvements in Real Madrid’s traditional business management. Following in North America’s footsteps, Pérez solidified Real Madrid’s brand image through various channels specified in Figure 2. Though the initial investment may be costly, the brand-based business model diversifies profit beyond what can be made from the stadium and live sporting events to reduce economic uncertainty. For example, even though celebrity players require a higher salary, strategic sponsorships and exploitation of the player’s image rights may completely offset the cost in two to three years. After the initial investment, Real Madrid may continue to benefit from celebrity players. Figure 2. Development of Real Madrid’s brand exploitation. Pérez increased revenue by 34 percent from 2000-2001 to 2004-2005 transforming Real Madrid into a debt-free firm with international brand recognition. While their economic situation stabilized, Real Madrid’s sporting performance was lackluster, which may have contributed to Pérez’s resignation in 2006. Future articles should compare Pérez’s business model with other sports clubs and explore effective resource allocation to sporting excellence and economic profitability. Callejo MB and Forcadell FJ (2006). Real Madrid Football Club: A New Model of Business Organization for Sports clubs in Spain. Global Business and Organizational Excellence.